*A Tale of 2 Monkeys*: Jerome Trip Re-Cap! A few weeks ago, the husband and I took a trip to Jerome for the weekend. Jerome is an old copper mining ghost town in Northern Arizona. 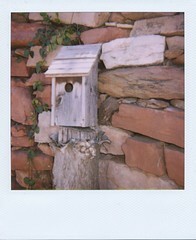 We have been several times, but only for day trips as it is very close to our home town of Prescott. 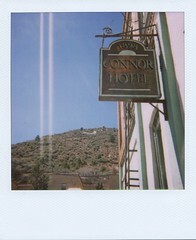 This time, we stayed at the Jerome Grand Hotel which used to be the hospital back when the mine was active. The thing that seems crazy to me is that Jerome is built literally into the side of a mountain, with the hospital at the highest point and the mine down at the foot. I can't imagine it was easy to get an injured miner to the hospital. With the hotel's history as a hospital and the mysterious death of an orderly who was crushed under the elevator, this place is considered haunted. We didn't experience any ghostly activity, but I did get to cross "Stay someplace that is haunted" off my 101 things list. The deadly elevator is still in the hotel, here are some pics. It is one of those where you have to close the outer doors manually before pushing the floor button. 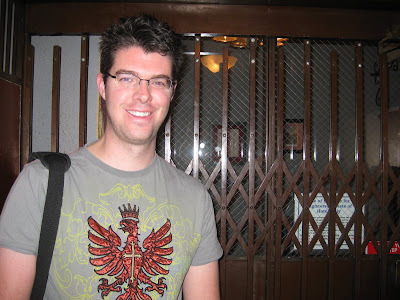 We stayed on the first floor above the lobby, but we still took the elevator every time because it was so cool. 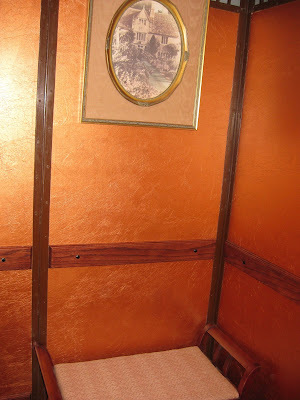 It was a very fancy elevator. 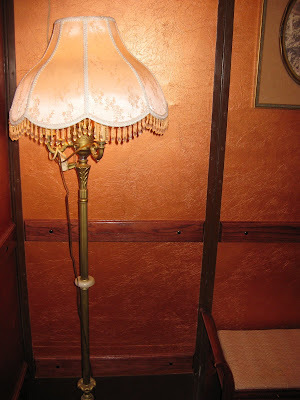 I think that modern elevators should have little benches and lamps in them. Most of the photos that I took that weekend were for my photography class and thus on film and in black and white. 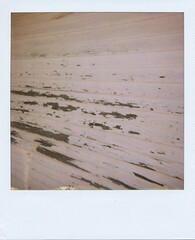 My goal is to eventually scan in all of those negatives after my class ends (in a couple of weeks). I'll be posting more of those at some point. 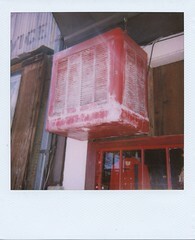 For now, here are my polaroids that I took that day. Several of them I have already posted here. 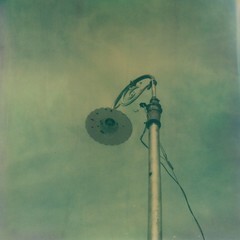 Here is an antique streetlight. You can see where the wire comes off - it actually stretches to the building next to it, rather than running underground like a modern streetlight. 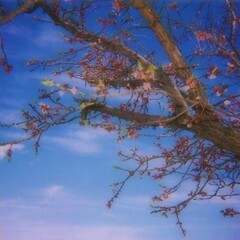 A pretty flowered tree that stretched out over the valley. 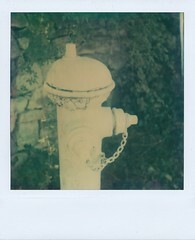 There were a lot of funky hydrants of various heights, shapes and colors. Here is one of them. Most of them are probably pretty ancient. I think that if humans were to die out, our fire hydrants would outlive us by hundreds of years. I love this quaint, crumbling town. So many great photo ops. 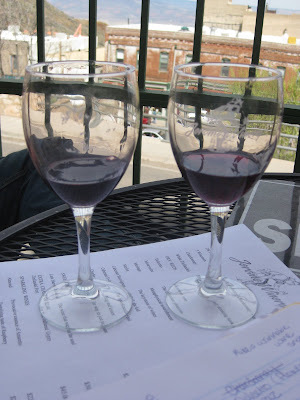 We went wine tasting at the Jerome Winery. Ironically, their vineyard is just outside of Tucson, where we went to school, but we never knew about it. The wine was quite tasty and we ended up buying a few bottles. We pretended we knew things about wine and swirled and smelled it and pretended we could taste the oakiness. For us, however, it comes down to "it tastes good" vs "I wouldn't want more than one glass" to make our purchasing choices. We did identify a chocolaty flavor in the first couple of wines we tasted, so that was something! Maybe we should learn about wine. 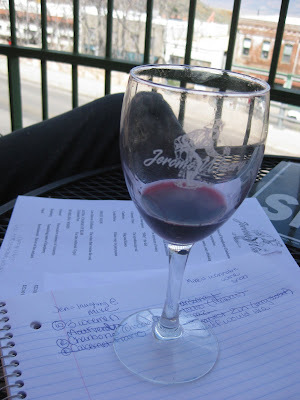 Here's evidence of our sophisticated note-taking during the tasting process. 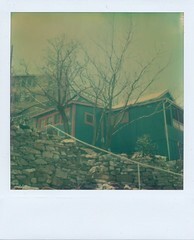 We finished up with lunch at the Haunted Hamburger, which is my favorite place to eat in Jerome. Unfortunately, it's everyone else's favorite too so we had to wait forever and eat at the bar. But, it was worth it. 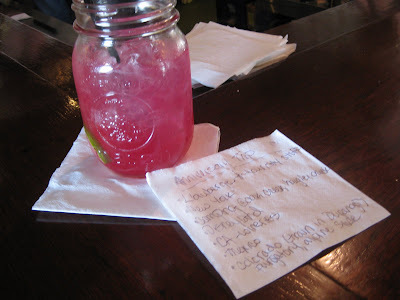 I had a yummy prickly pear margarita (it's an Arizona thing, but try it if you're ever here!). We also made a list on the bar napkin of possible trips to take for our wedding anniversary. A fun trip, I recommend making a stopover if you're ever in the area. I love how the margarita comes in a mason jar. very casual/rural az. Wow, I always think of ghost towns as being so much ... emptier. What motivates people to just abandon an entire working town??? Thanks for sharing your pics! I love Jerome, nice photos! 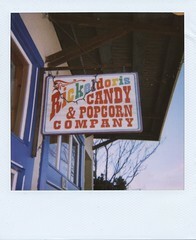 I especially like the Candy & Popcorn CO sign. I wish you had experienced some ghostly activity! @TwoWishes Jerome was primarily a mining town (copper mostly). When the mining dried up, the people moved away. Now it's mostly an artist and tourist town. There are tons of galleries and shops, as well as many great restaurants.